Response seems wildly enthusiastic, with various reviews up already - there's one at The Mod Resource, another at Amped DX, and maybe another couple elsewhere. Edit: 2006-03-13: here's another review, courtesy of The Abandoned Workshops! Download count right now: 32,980, including those via Bittorrent. Not bad - and it probably would have been higher if (a), my webhost decided to suffer from major network connectivity problems shortly after a link was posted in a Steam news update, and (b) I'd tested the website properly before launching, so an amusing Internet-Explorer-sees-outdated-pages bug might never have appeared. Oops! Some reading material for you: courtesy of CGW's Shawn Elliott, there's the MOD Summit at 1UP.com, with short interviews with people from all aspects of games modding - the developers of the original games, modders who've made it big, and then the current crop of modders themselves. Including yours truly. 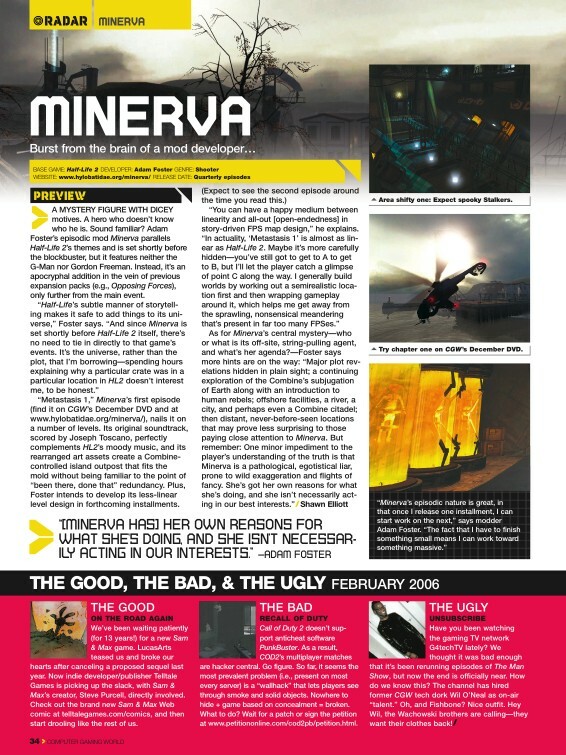 Also for download, a copy of the interview from Computer Gaming World magazine, courtesy of Shawn Elliott again. Enjoy! Finally, a quick technical note on this very news system. I've finally got round to replacing the editing-raw-XHTML with something more ... modern. So, I present BaaBaa-BlogSheep(tm), the glorious new blog system written in an afternoon by myself. 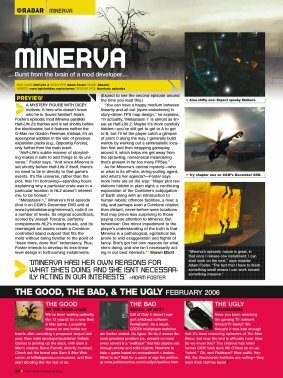 It's still very crude at the moment, but it already has an RSS (Really Simple Syndication) feed, so you can stay up-to-the-minute with MINERVA news (wahey! ), and I've also started work on a comments system. Yes, really. Interactivity on this website? Wonders never cease!